Vee speaks again with MONEY FM 89.3 this morning. He gives his thoughts on the first half of 2018 and what the second half of 2018 holds for FX. Hear what he thinks of the USD and Fed hikes, what’s next for the pound after coming under pressure for the past quarter and whether the weakness in Yuan will continue. Looking to receive weekly podcasts like the above? Subscribe to the Traders’ Risk Call and receive professional views delivered to your mailbox every week. Use coupon code PODCAST40 at checkout for 40% off your subscription – valid for this week only! Listen to TrackRecord’s CIO, Phan Vee Leung speak with Ryan Huang of MoneyFM 89.3 (SPH Radio) about the FX market this week! Fresh off LIVE radio this morning! The Fed is determined to continue hiking and ECB is unlikely to start tapering anytime soon. Technically, EUR/USD has failed at key resistance levels. The deadline given by the Prime Minister of Spain Rajoy to Catalan President Carles Puigdemont to clarify his declaration of independence has come and gone. The response from Puigdemont remains vague as he calls for more “dialogue”. The central government now gives him till Thursday to change his stance on secession or face the consequences. Puigdemont has, essentially, painted himself into a corner. Going ahead with the independence declaration will likely lead to the central government invoking Article 155 of the constitution and suspending the authority of the Catalan government. Backing away from the declaration will provoke the ire of his supporters and lead to the unraveling of his pro-independence coalition. Whichever path he takes, the political situation remains uncertain and will continue to weigh on the EUR. From what the Federal Reserve Chair, Janet Yellen, has been telling the market all along and as recent as over the weekend, the Fed is going to continue hiking at a gradual pace and there will be one hike before the year ends (most likely in the December policy meeting). Although inflation has remained subdued (or possibly, due to this), economic numbers have continued to be good and stocks continue to trade well. S&P 500 continue to make all-time highs on a regular basis. As long as this remain so, the Fed is unlikely to diverge from their much advertised plan. Is The EUR Retracement Over? Market pricing for one more rate hike before year end is still hovering around 70% probability. Risk of Catalonia declaring independence from Spain is higher after the referendum over the weekend. Technically, EUR/USD has reached short term support. The Dollar Index is also running up against short term resistance on the daily chart. Having called for a lower EUR and with the short term targets met, what are the reasons that could lead to more weakness in the currency? The dot plot from the previous Federal Reserve Board meeting on 20 September showed that most of the voters are still expecting one more rate hike before the end of 2017. Janet Yellen, chair of the Board, last week warned that “It would be imprudent to keep monetary policy on hold until inflation is back to 2 percent” and the Fed “should also be wary of moving too gradually.” This is consistent with what the Fed has been trying to convey all this while i.e. barring drastically weaker than expected economic numbers, there will be one more rate hike in December. Although exit polls show that Angela Merkel’s center-right Christian Democrat-led alliance has secured 33% of the overall votes, she is now faced with a daunting task of forming the next government as she does not have an outright majority and the leader of her coalition partner from the previous government, Martin Schulz of the Social Democrats, has declared that they will be going into opposition after garnering only 22% of the votes – their worst electoral result since 1949. The rise of the Alternative für Deutschland ((AfD)) is particularly worrying as this is the first time that a far-right party has managed to win seats in the Bundestag since the immediate post-war period. In the previous election in 2013, the AfD could not even manage the minimum 5% required for a party to have any seats in the Bundestag but a surge in voter discontent over Merkel’s refugee policy has led to the party winning 13.5% of the votes this time round. CHF: Will The SNB Embrace The Weakening Currency? Swiss National Bank (SNB) meets tomorrow. The Swiss Franc (CHF) has weakened more than 5% since the last they met. Given recent weak economic data (GDP, CPI and retail sales), the SNB has no reason to change its stance for continuing with the ultra easy monetary policy. The SNB meets tomorrow, and though the CHF has weakened in recent weeks, it is still in the zone of significant overvaluation. The SNB is unlikely to do anything other than stick to its current ultra easy monetary policy. It is telling that even after all the uncertainties cause by North Korea, EurChf is trading close to its highest levels since the 1.2000 floor broke in early 2015. As the world starts to remove stimulus (The BoC & US Fed have already started and ECB is considering tapering options) that was implemented to cope with emergency conditions, the SNB is likely to be one of the last to exit (a toss up between BoJ & SNB). Consequently, the Chf is likely to continue on its weakening trend for the months ahead. As long as 1.1050 is not violated, the EurChf is technically headed for 1.2000 and beyond. Disclosure: I am/we are long EURCHF. Breaking to new lows last seen in mid 2015, the trend is set to continue. The BoC surprised the market with a hike and a statement that shows that their intention of removing “considerable” amount of stimulus from the system remains. This is the second hike of this cycle which started with the hike in July. In the age of ultra dovish central bankers who have a tendency to wait and see and hike at a glacial pace if at all, this is as hawkish as you can get when you are living in a world full of uncertainties such as Trump policies/tweets and the recent North Korean tensions. Clearly, the economic data is giving the BoC the confidence to do this. Their statement spoke of stronger than expected growth both in Canada and globally. 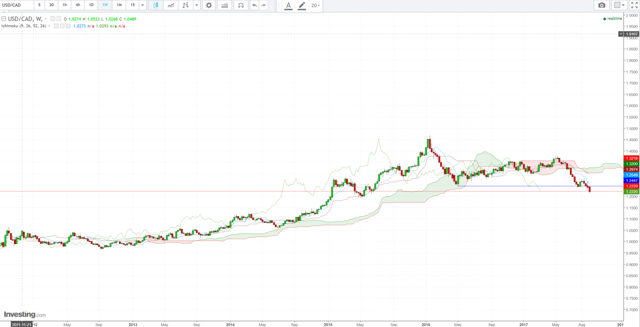 With strong commodity prices of late, the Canadian dollar (NYSEARCA:CAD) clearly has all the fundamentals aligned for the strengthening trend to continue. With growth continuing to be strong (as evidenced by the latest GDP YoY growth of 4.5% vs market expectations of 3.7% released two weeks ago) and financial conditions remaining easy (stocks making new highs every other week), the fundamental reasons for continued CAD outperformance is strong. With the decisive break below the previous two lows (indicated by blue horizontal on chart), as long as 1.2450 resistance is not breached, the downtrend in USD/CAD is set to continue. I would be selling any bounces to the 1.2200 handle with a stop above 1.2450. The near term support would be at 1.1960 with an eventual target of 1.1000. 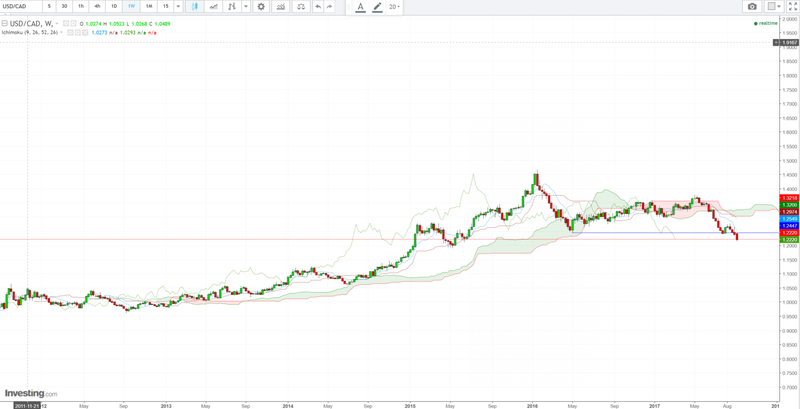 Given that the fundamentals, technicals and central bank policy are pointing in the same direction, it is not too late to jump onto the train as it is early days yet! Disclosure: I am/we are short USD/CAD. Additional disclosure: …and looking to sell more!